There are many types of willows. The most well known type of willow, salix viminalis, always grows near bodies of water. This species, which measures between 3 and 6 metres high, grows in many places, even in mountains up to 1,200 metres in altitude, except in the Mediterranean, in Brittany and in Corsica. Salix viminalis is a member of the Salicaceae family. 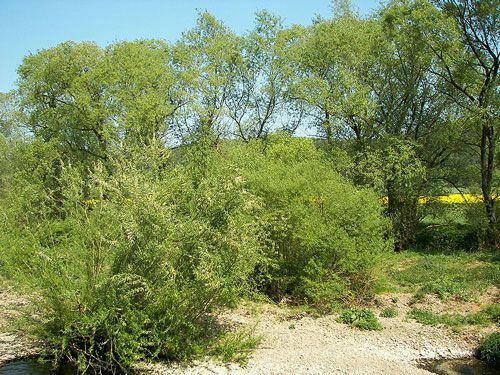 In some regions, it is also called an "osier" or "common osier". This small tree, which grows upwards, produces very long, flexible and pubescent branches, of a greyish greenish colour when they are young, that later become greenish to brownish yellow. Its leaves are deciduous, alternate, extremely narrow, lanceolate and measure 20 centimetres long and 1 centimetre wide. They are dark green on their upper side and silky, silvery white on their lower side. Its male and female flower catkins appear in March-April on young shoots, before the foliage develops. This species comes from Europe and the temperate areas of Asia. Salix viminalis needs sufficiently humid soil in order to grow. It likes full sunlight and spontaneously colonises deserted plots of land. It is often pollarded, meaning pruned to have a dense head, to facilitate the growth of young branches used by basket makers. This species is grown in gardens for ornamental purposes. In the past, its wood was used to build kayaks. Cut into slender strips, willow wood is used to make hats, while its branches are used to make baskets. In particular, its branches are used to make wicker.